We all think it’s not going to happen to us, but if it does, having done fire drills with your family, can be a blessing in disguise. One of the greatest things that you can do for your family’s safety is prepare a home fire escape plan. This way, in the event of a fire or other emergency, the entire family will know what to do without panicking. Make sure your smoke detector are in working order. A smoke detector can be your first detection that there is danger of smoke or fire in the home. Prepare an escape plan for every room in the house. Discuss each possibility – if the door is blocked, use the window, and so forth. In case of darkness or smoke, have your family practice staying low to the ground and evacuate the house while it is dark, or put a blindfold on. This can help simulate the effects of a fire and minimize fright and panic should a fire occur. Be sure that every member of your household knows how to open the windows and remove the screens for escape. Pick a meeting place for the whole family to meet once they have escaped the house. Talk to a neighbor about borrowing their phone to call 911 in the event of a fire, and designate a family member to do this. Be sure that children are familiar with firefighters and are not scared of them. 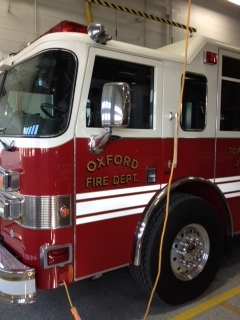 Many fire stations have open houses in the summer where kids can go and meet them! Use these tips to help promote a safe and calm household in case of fire! PreviousPrevious post:Myth Buster – Pet InsuranceNextNext post:Is a Cat The Puuuurrrfect Pet?